.Here is a card I made a few weels or so ago inspired from pinterest as all my cards seem to be of late. All you need for this card are a few strips of paper a border punch a few hand made flowers a bit or ribbon or lace and a sentiment stamp or a peel off ..I punch flower shapes from all my scrap paper or tiny butterflys from the tinyest of scraps.This is one of my favorite styles of card at the moment and my favorite types of colours.I hope you like it too. Hi Lyn, this is fabulous, love the colour combination and the beautiful lace and flowers. Fabulous card Lyn - your choice of papers is excellent!! It is so pretty Lynn..I love it. Lyn, thanks for entering over at Kraftyhands, hun, but I dont know which card I am looking at as the challenge entry as you havent linked to it or mentioned that its entered in the challenge? 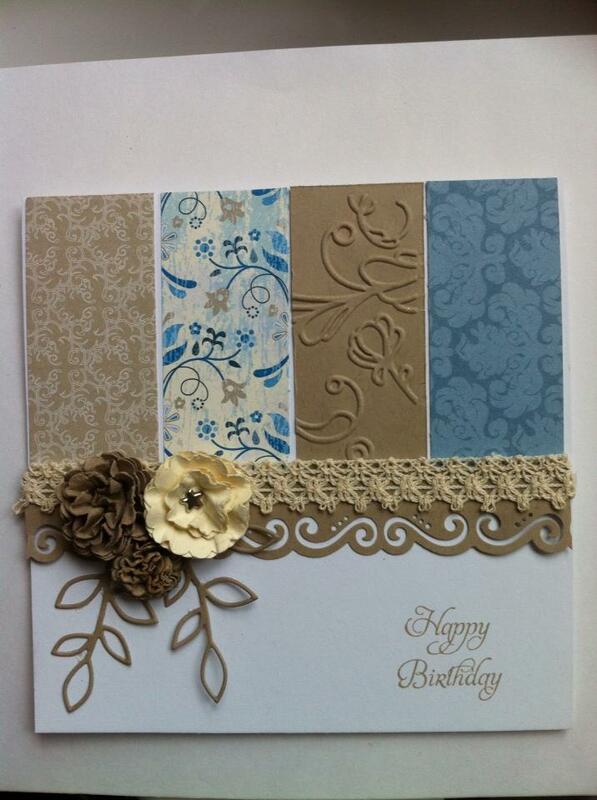 Hi Lyn, thank you for entering your beautiful card into our Kraftyhands challenge. Unfortunately it doesn't meet with our challenge which is no squares allowed. We do hope that you will enter our future challenges. I do like how the colours work together. A simple layout of background pieces that's built a very elegant card.